Sometimes referred to as a weed of habitation, this plant is found throughout the UK and Ireland. Stinging nettles are perennials and grow to typically 1m in height but can reach 2m in suitable damp, shaded locations. In winter the plants usually die back completely. Leaves are elongated heart shapes and have strongly serrated margins and are covered in hairs, some of which act like hypodermic needles, breaking off and injecting stinging chemicals into anything (and anyone!) contacting them. The male and female flowers occur on separate plants. 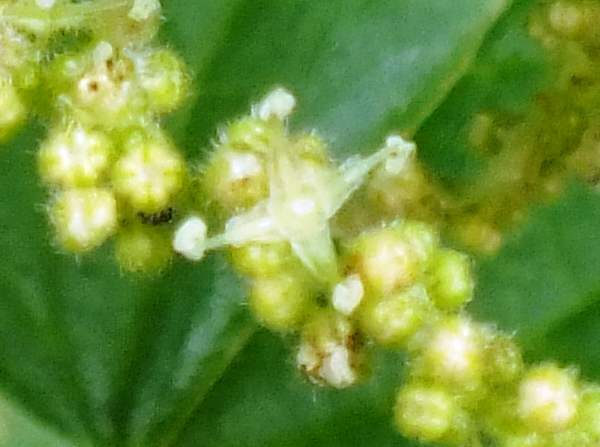 Both flower sexes are green with yellow stamens, but the male flowers often have a purplish tinge and the female flowers tend to droop much more than the male flowers do..
Urtica dioica is found throughout Europe, where it is particularly common and widespread in the north. Its range extends southwards into North Africa and estwards into parts of Asia. This species (of which there are several recognised subspecies) is also found in North America. Stinging Nettles are most commonly seen on the edges of woodland, roadsides and some river banks, but they readily colonise any wasteland and sometimes invade permaent pastures. 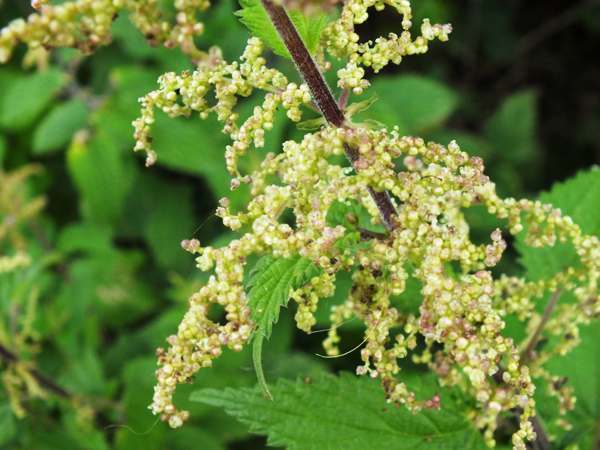 Plants of Urtica dioica bear their flowers throughout the summer months. The specific name dioica means 'two houses', a reference to the fact that male and female flowers grow on separate plants. Nettle wine is made from the young fresh shhots of Stinging Nettles. 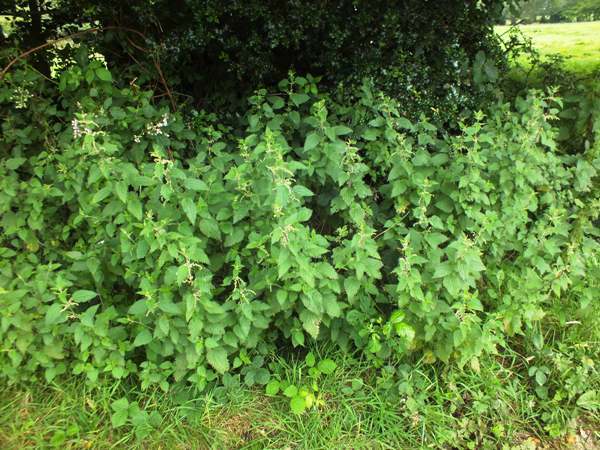 If you do get stung by nettles, rubbing the affected area with a dock leaf is recommended to alleviate the pain. The Stinging Nettle plants shown on this page were photographed in West Wales.